Most of our author and illustrator birthday celebrations are planned well in advance, however occasionally we will have a spontaneous celebration that surprises us. I love the spontaneous celebrations because I don't have the stress of planning out an activity and the worry that it won't work out the way I saw it in my head. This week, coincidentally, we had a spontaneous birthday celebration for a very spontaneous illustrator, Quentin Blake. Quentin Blake has illustrated over 300 books including Zagazoo, Loveykins, and Mrs. Armitage Queen of the Road. Most of us are familiar with his illustrations in chapter books by Roald Dahl like The BFG and Charlie and Chocolate Factory. Quentin Blake has been illustrating since the age of 16 when his drawings were published by Punch magazine. In college he studied English and earned a post-graduate teaching diploma (quentinblake.com). In 1960, he published his first book, A Drink of Water by John Yeoman. 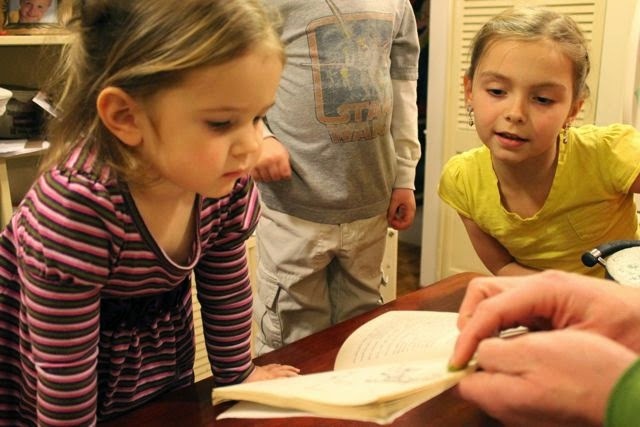 Eight years later he published his first book, Patrick, as both author and illustrator. Throughout his career, Blake was also a teacher of art at the college level. In 1999, his experience creating books and art and teaching students in the classroom made him an ideal selection for the first ever Children's Laureate. He followed up his tenure as Children's Laureate with being awarded the Hans Christian Anderson Award for illustration in 2002. In a video by Tate Shots (YouTube), Quentin Blake discussed his recognizable illustration style, "I want everything I do to look spontaneous. It's not that I think illustration should necessarily be like that, but this is what I can do." In addition to all of his children's books his spontaneous artwork can now be found in hospitals and other health care settings. He hopes that his artwork not only brings smiles to the faces of the patients but to the families and friends visiting too. In 2013, Quentin Blake received knighthood to recognize him for a career that has brought happiness to both children and adults. 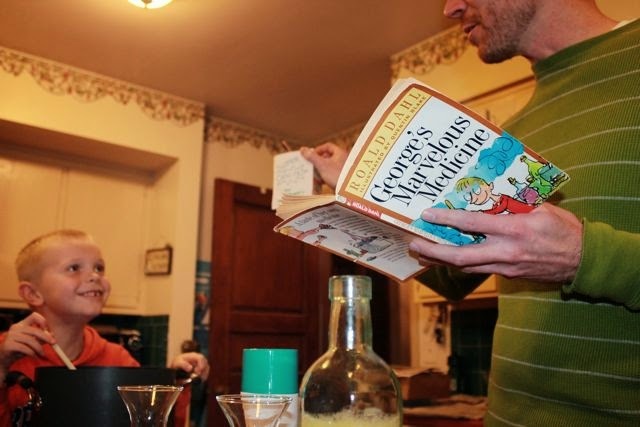 Our spontaneous birthday celebration began with a used book sale where I found a paperback copy of George's Marvelous Medicine by Roald Dahl and Quentin Blake. That night I decided to read it to my boys before bed. I thought I would read one or two chapters and call it a night. My boys had other plans! They really got into the story about George whose parents left him home alone to take care of his grandmother. I think my boys were initially creeped out by George's grandmother who became very mean after George's parents went away. They were hooked (and no longer creeped out!) 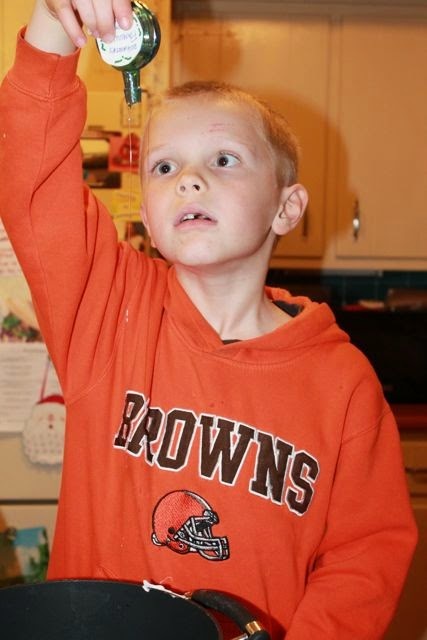 once George planned to prepare a new medicine he hoped would "shake up the old woman quite a bit!" 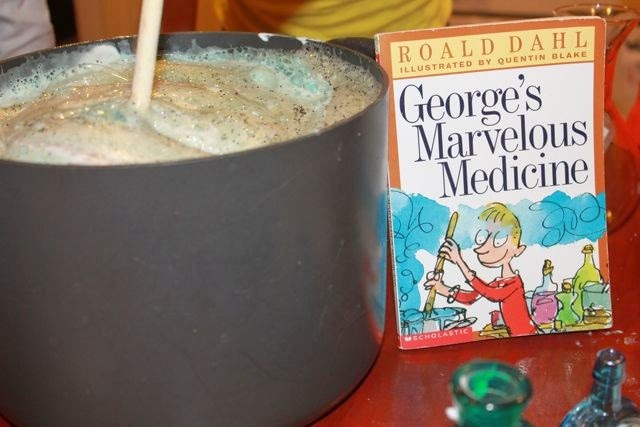 The next day, while everyone was downstairs playing, I gathered up items from around the house just like George did when he prepared his marvelous medicine. I found a can of shaving cream which became SUPERFOAM SHAVING SOAP and a box of baking soda which became SUPERWHITE FOR AUTOMATIC WASHING MACHINES. 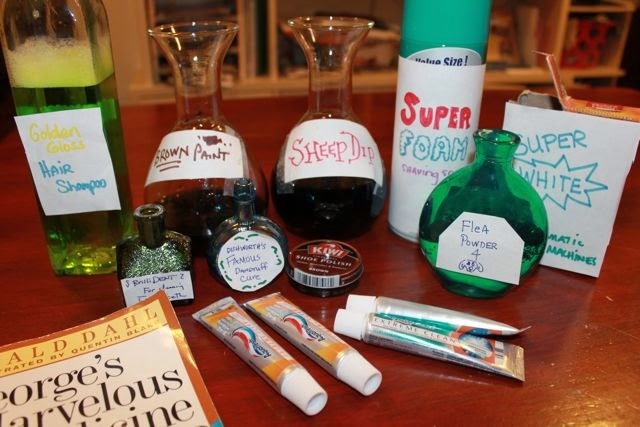 I also colored vinegar with food coloring to make BROWN PAINT and SHEEP DIP. These were all items George added to his marvelous medicine for his grandmother in the book. 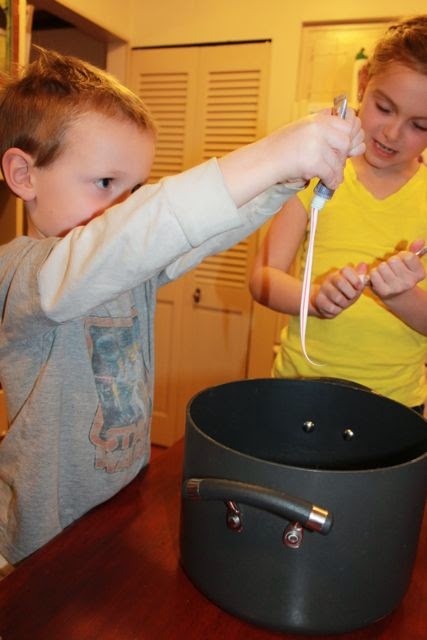 My children each squeezed a tube of toothpaste in "one long worm" just like George. We emptied our can of SUPERFOAM SHAVING SOAP. My daughter added the FLEA POWDER FOR DOGS which was actually baking soda and glitter. 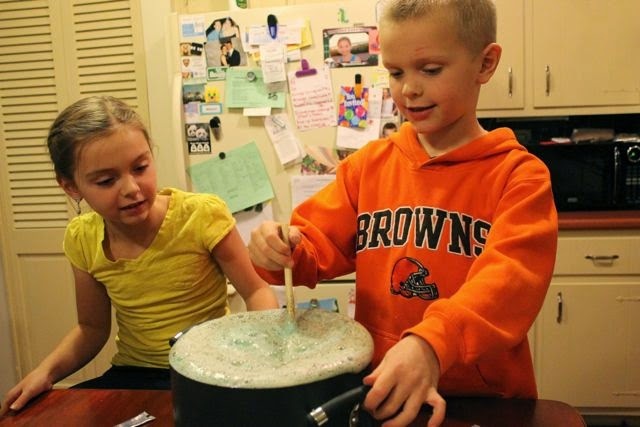 My son poured DISHWORTH'S FAMOUS DANDRUFF CURE into the pot which was actually yellow dish washing soap! 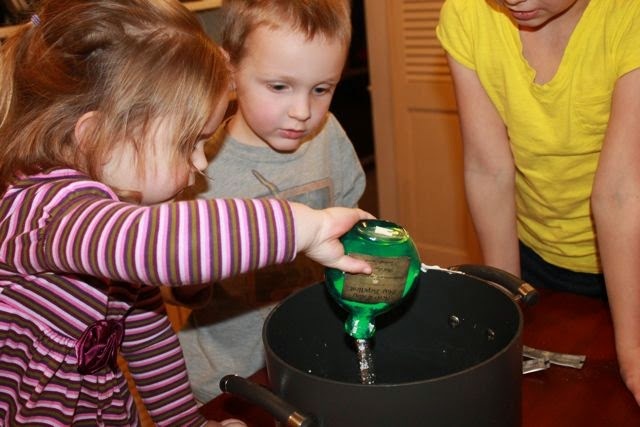 We saved the items that were actually colored vinegar for the end (BROWN PAINT and SHEEP DIP). 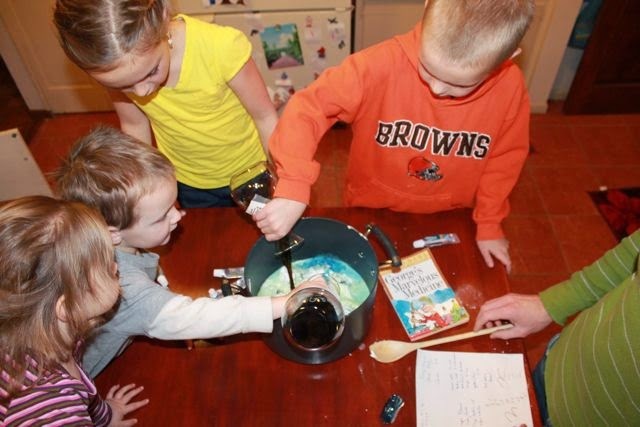 Their job was to react with the baking soda in the pot to give our MEDICINE an explosive kick! 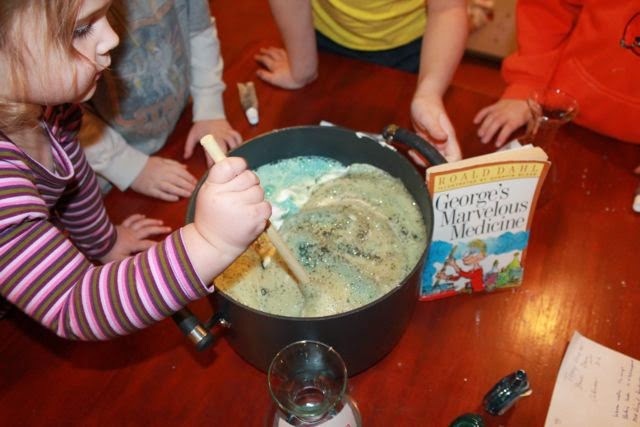 Each of my children took turns stirring the bubbling brew with a wooden spoon. It bubbled right up to the top! It looks like it is ready to give to Grandma! I hope you enjoyed our birthday celebration. The truth is that I have tried to celebrate Quentin Blake's birthday with my children for a few years now. 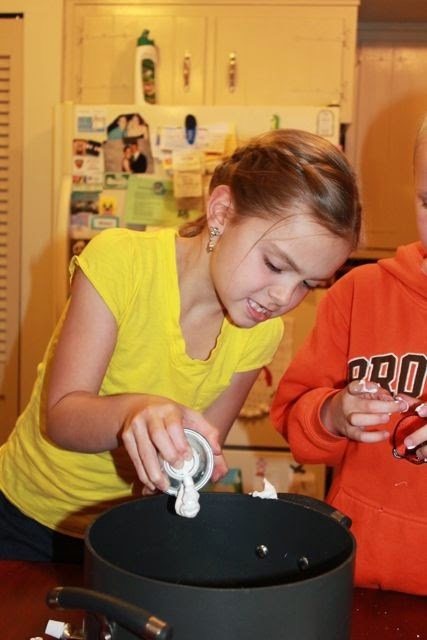 The busy holiday season and always made planning an activity overwhelming. I guess I was just trying too hard and needed to be more spontaneous!